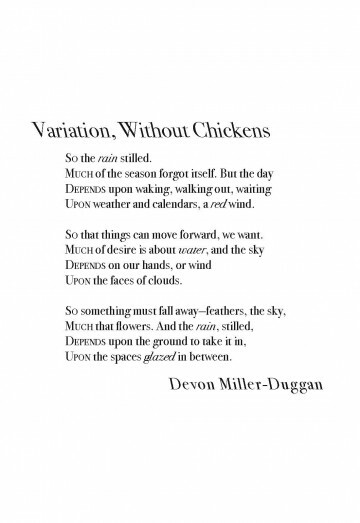 Devon Miller-Duggan’s first collection, Pinning the Bird to the Wall, was published in 2008 by Tres Chicas Books. A chapbook of off-kilter poems about angels was just published in September by Finishing Line Press. She teaches Creative Writing at The University of Delaware. It’s a tricky thing, writing homage. Stray too close to the original and you’re ripping off your hero. Venture too far afield and your readers won’t make the connection. With this poem Miller-Duggan pulls it off because she riffs on sound where William Carlos Williams riffed on image. Each stanza swells to a crescendo by varying the combinations of r, w, d and s sounds; each stanza break lets the sound “glaze” “the spaces… in between.” The overall effect is a series of quick summer storms that swirl around the “red wheel/ barrow” of the source material. Indeed, “something must fall away – feathers, the sky,/ Much that flowers” for Williams’ poem to be born. The poet has imagined those lost details and made them her own. So much of literature depends on what went before it; even when we’re not building on the past we’re breaking from it. A classic book typeface like Bodoni offers a long history but it also looks good doing things it’s designer never intended, like small capitals and reversed italic. The various styles are deployed to underscore the poem’s nods to WCW’s famous piece while maintaining a harmonious, modern integrity.